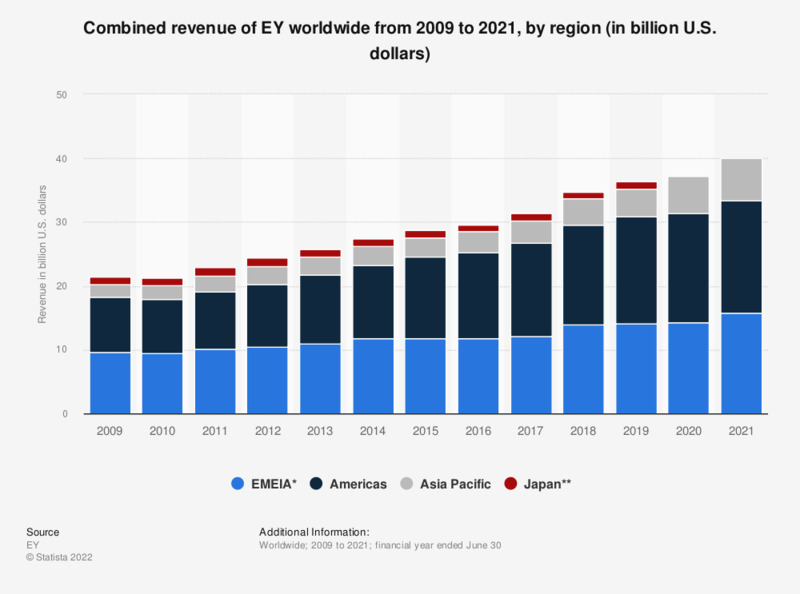 This statistic shows the combined revenue of EY (Ernst & Young) worldwide from 2009 to 2018, by region. In the 2018 fiscal year, EY generated approximately 4.1 billion U.S. dollars in revenue in the Asia Pacific region. EY is not a global corporate structure where ownership, legal control, or profits are consolidated at a central parent entity. The financial information presented here represents combined, not consolidated, revenues, eliminates inter-firm billings and includes expenses billed to clients. * EMEIA = Europe, Middle East, India, Africa. Everything On "EY (Ernst & Young)" in One Document: Edited and Divided into Handy Chapters. Including Detailed References.